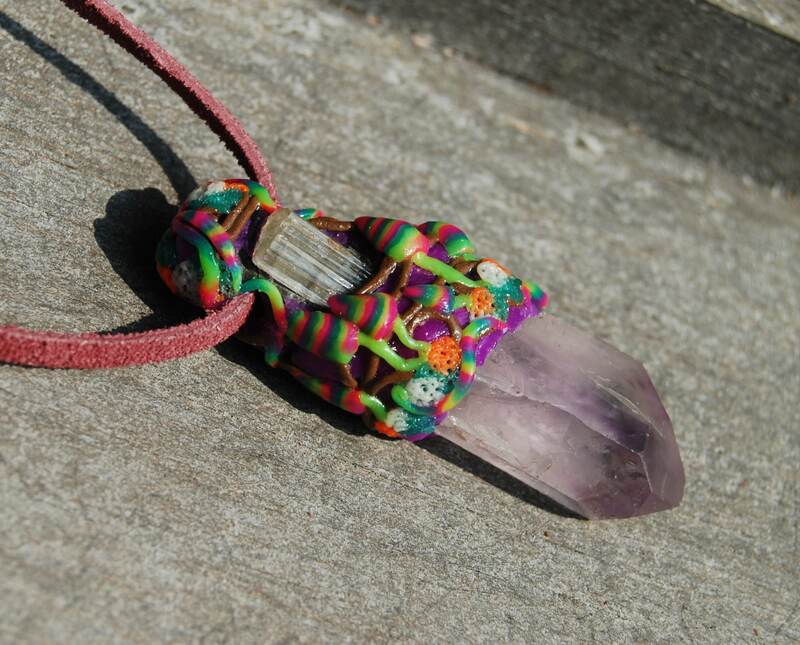 This is a special natural terminated Amethyst Vera Cruz Crystal point with raw colorless Tourmaline in a handsculpted colorful clay setting. The clay glows in UV Blacklight. Unique and very nice ! Vera Cruz Amethyst is so named as it originates from the Los Vigas Mine, in Vera Cruz, Mexico. 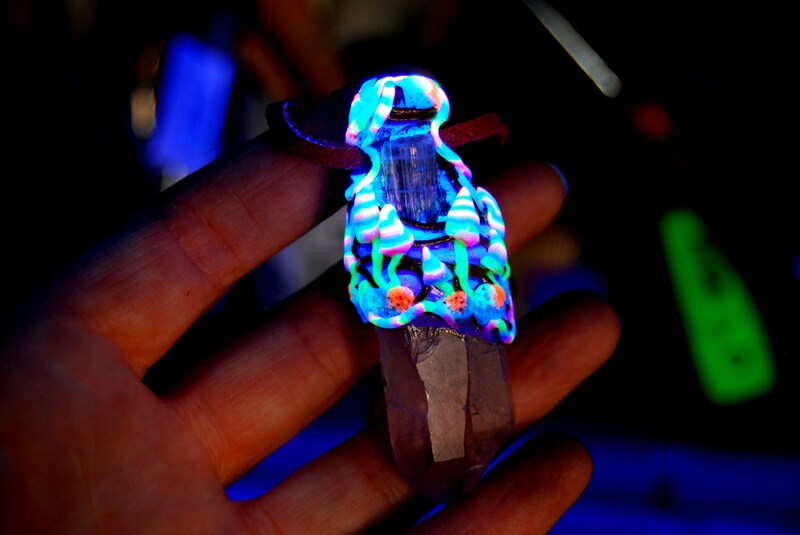 The crystal is now quite rare, as the mine was shut down many years ago. Vera Cruz Amethyst provides a channel for earth energies to connect with the spiritual. 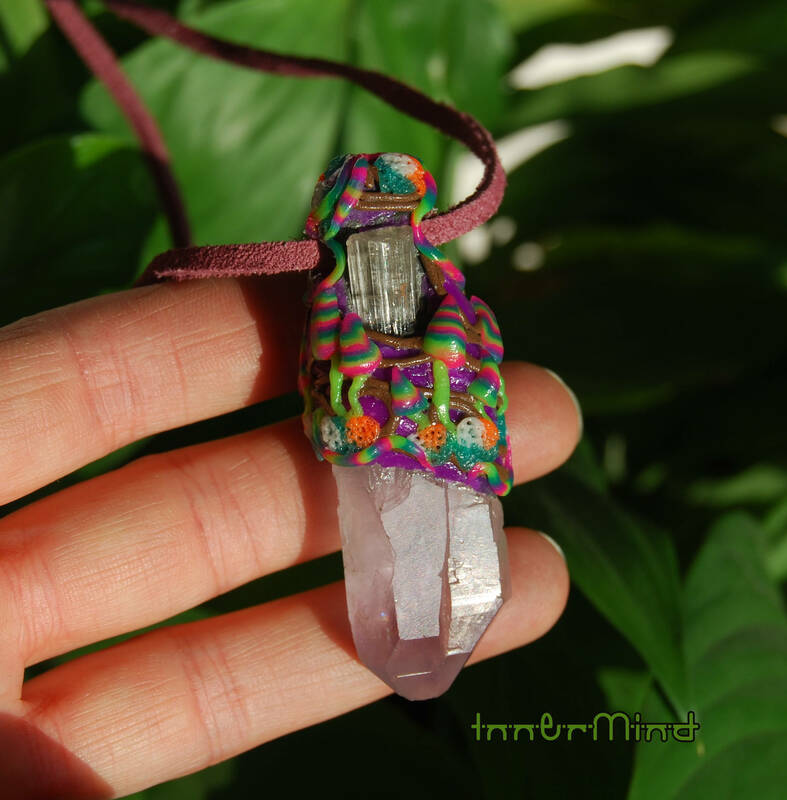 Vera Cruz Amethyst is an excellent meditation and scrying aide which activates the crown chakra. 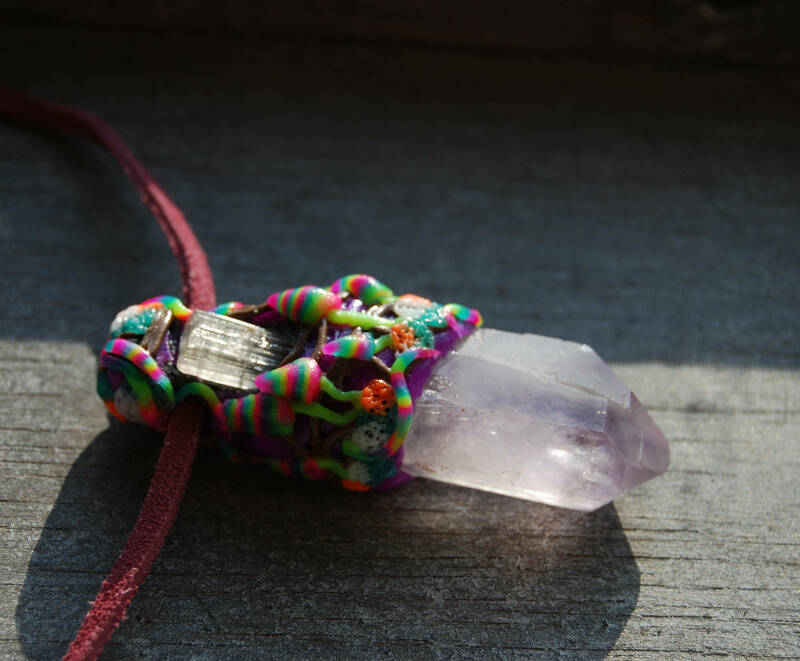 Vera Cruz Amethyst is the crystal of spirituality and contentment, assisting one to connect with pure peace humanities natural state of existence. Vera Cruz Amethyst opens intuition and spiritual wisdom. Vera Cruz Amethyst blocks geopathic stress and protects against psychic attack. 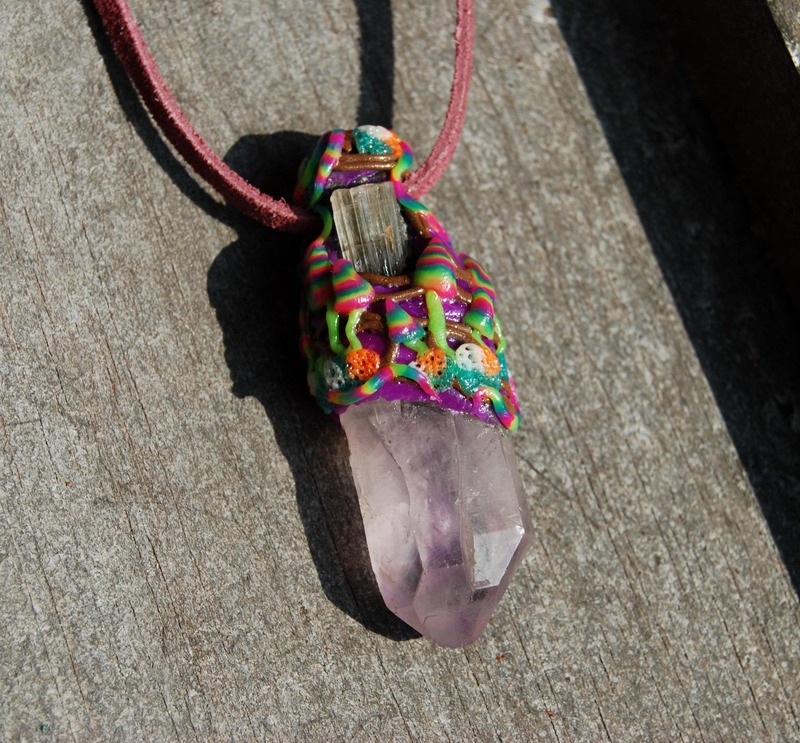 On a metaphysical level, Amethyst is a crystal of awakening and transformation. 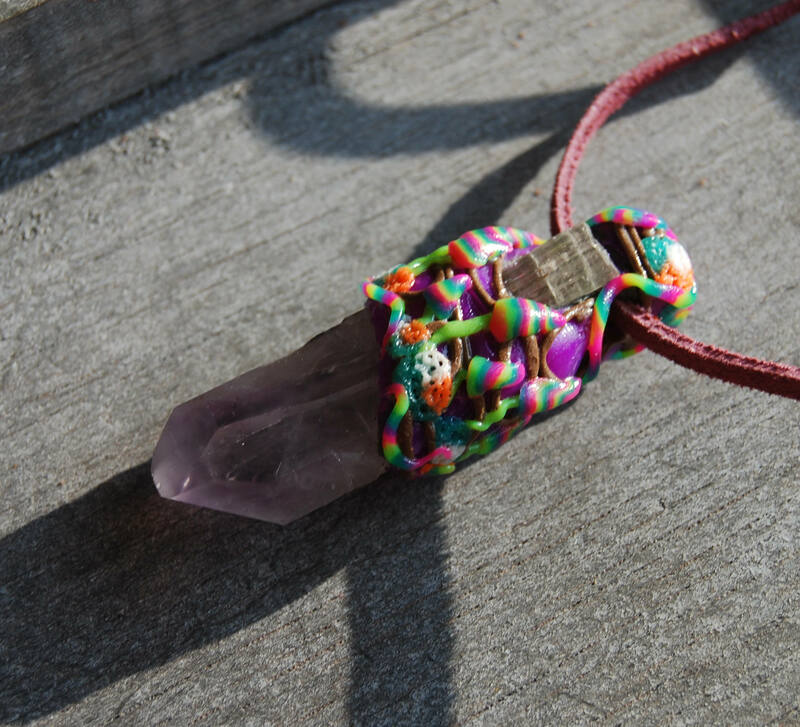 It is often the first crystal that people become attracted to, thus synchronistically it opens a person’s conscious awareness to their higher-self and so begins their journey of conscious evolution and personal growth. Amethyst is used in clearing and protecting the auric field, protection from EMRs (electro-magnetic radiation) and for repairing holes or weakened layers within the seven levels of a person’s energy field. Amethyst also has a long tradition of being used to alleviate or transform addictions, in particular alcohol abuse. Vera Cruz Amethyst has all of the above properties, but in addition its high energetic frequency lends it to many other uses. 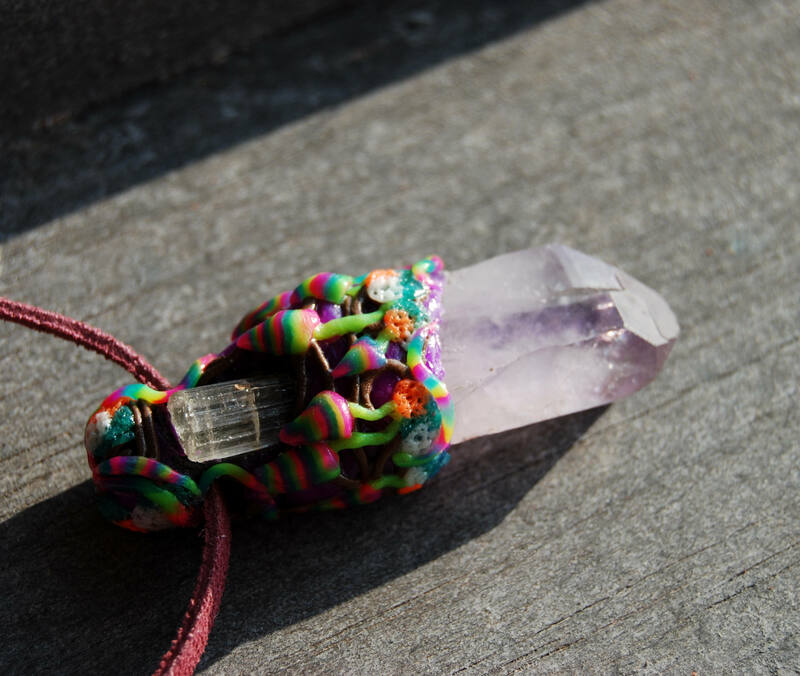 Vera Cruz Amethyst are an invaluable ally to use on the third eye to awaken the Pineal Gland, activate the Golden Crown Diamond and stimulate our Primordial cells. 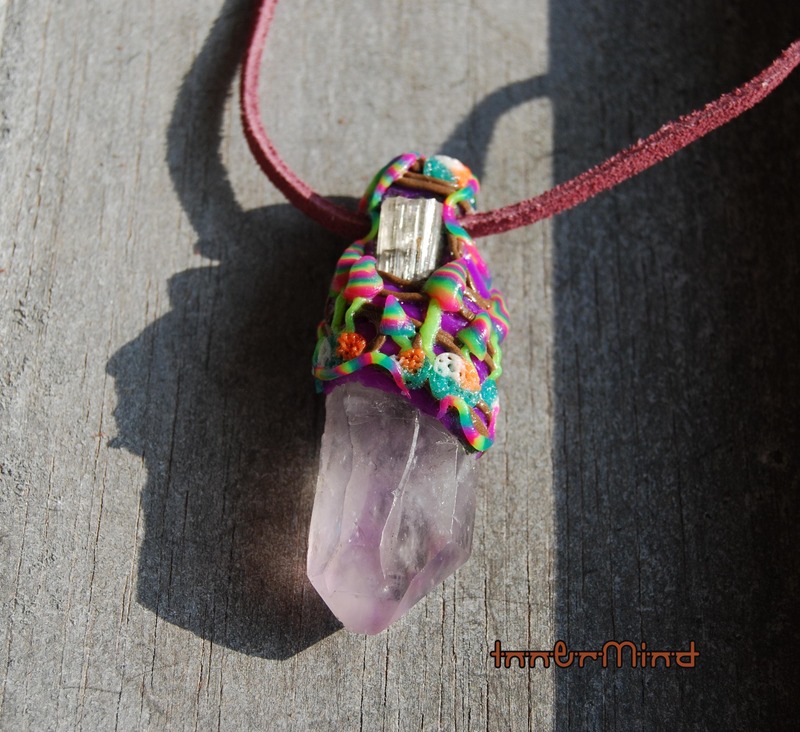 When Vera Cruz Amethyst is placed over the Third Eye Chakra, the Pineal gland begins to resonate and awaken. The Pineal Gland then magnetically attracts universal ‘cosmic light’ energy, down through the Crown Chakra and into the Third Eye and into the Causal Chakra (at the back of the head), side Chakra’s (above the ears) and the Alta Major Chakra at the base of the skull. This formation builds a ‘Golden Diamond of Light Energy’ around the head. It is made with good quality clay. However, it is best to avoid swimming or showering with it. It comes on an adjustable suede cord. If you prefer a 2 mm strong cotton cord, just let me know in the comment section while order and Ill happily replace the suede for a cotton one for you. Size is 6.7 cm / 2.6 inches from top to bottom. Free worldwide Shipping for this lovely pendant. Will be shipped in a giftbox with Tracking number.